Sorry, boys. This dress is a hot mess on male toons. If you don’t like it, write to Blizzard and ask for — no, demand — equal opportunity sexiness. Check out the whole set on Wowhead. And the persnickety “Mage’s Only” sticker once again rears its ugly head. I was really hoping — praying, even, to the Light and just about anything else that would listen — that Frostfire Shoulderpads, available on the Black Market Auction House to any cloth-wearing player with the coin, would share Heroes’ Frostfire Shoulderpads‘s skin. But alas, the original Frostfire shoulders are blue, not peach, making this cloth transmog set one more sacrifice at the altar of well-dressed wizardry. Well, well-dressed Alliance wizardry, anyway, because the Horde version of Tyrannical Gladiator’s Cord of Meditation is, again, entirely the wrong colour. 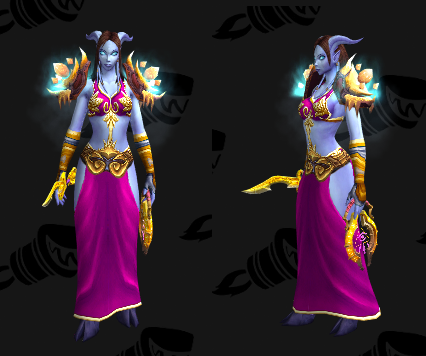 Of course, a creative Horde mage could probably find an alternate belt and maintain the soul of the set. If you’re a Horde player who’s not creative, let me know, and I’ll try banging my head against that particular wall myself. Oh, and Cournith Waterstrider’s Silken Finery is actually a BoE rare drop from a rare that can be found loping around Pandaria, so make sure you know what you’re killing before you start to grind. And yeah, on most toons, you’re going to see a sliver of black where the top of the stockings peeks out from behind the dress. It’s frustrating, but, so far as I can tell, there are no pants available that will be completely invisible with this dress model. Because if you're going to haul yourself across Azeroth collecting infested bear intestines, you might as well look fabulous while doing it. This website is hosted on DreamHost, which is awesome. If you're looking to host your own website (or websites -- yes, you can host as many sites as you want) and want to chip in to help with our hosting fees, consider using the link below. Oh, and because I used that affiliate link one time, I'm obligated to say that this website is a member of the Amazon Affiliates program, the eBay Partner Network, and the J!NX affiliate program. That means if you use an affiliate link and make a purchase, I'll receive a small credit in compensation. Don't worry, this isn't going to be a thing.